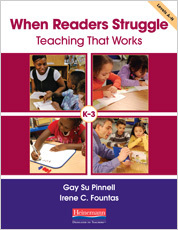 Our school began using the Fountas & Pinnell Leveled Literacy Intervention System (LLI) in the winter of 2011. It's an early intervention system for small groups that we purchased to supplement our literacy program and to support our lowest achieving students in the early grades. It has been very successful for student learning and unexpectedly, it has been a great source of Professional Development for our teachers. Through creative planning with a supportive principal, we were able to collaborate and learn all about the LLI system as a team. We were given time to meet twice monthly to discuss lessons, students and our own learning. We also collaborated with our sister school and started a professional book club using "When Readers Struggle - Teaching That Works" by Gay Su Pinnell & Irene Fountas to expand our knowledge and understanding of how children learn to read. Not only has this system been successful in supporting our lowest achieving students but the material and resources provided by this program gave teachers a solid knowledge and understanding of what an effective guided reading lesson looks like in a classroom. The lessons in the program provide teachers with powerful, daily, small-group instruction that they were able to put into practice and embed into their classroom literacy instruction. This process helped to enhance effective literacy practices at our school. Have you found unexpected PD opportunities in your school? Please share!